www.officer.com January 2016 Law Enforcement Technology 17 are going to be on you. If you don't have the passion don't even try. When I got here, it was hard for me, physically and mentally, and as the days and months went on, with the camaraderie we all have, this was the best decision I ever made in my career and I love it." Don't Give Up Berkeley's Louis stresses that women shouldn't take the opportunity lightly. "I would tell women interested in tac- tical teams to have awareness of their unique position, and the obligations that this involves," she says. "They have to be passionate about the work. They have to be willing to put in the blood, sweat and the time to be a good teammate. Women very much have a role in SRT and have some- thing to add to the team, but there will always be a magnifying glass on us. The mistakes of one woman can be applied to all women." When you make it to SWAT, con- centrate on your performance. "You have to focus on being a part of the team," says Ahrens. "Do not complain. People won't remember the men who complained, but they will remember the women who did. You can't go in to try to change things. You have to get along and blend in." 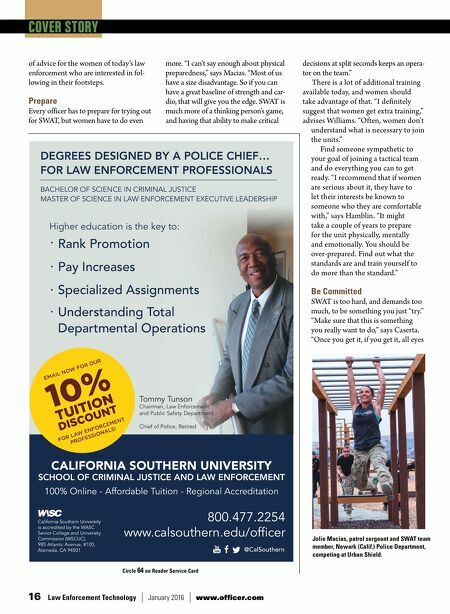 It will be worth it Getting through it all and onto the team is worth it, according to Williams, who has been on SWAT for seven years now. "It is everything I thought it would be," she says. "The team is much different now than when it first started—we work so well with each other and sup- port each other. The camaraderie and relationships I have are awesome. Not giving up and coming back and trying harder was all worth it. 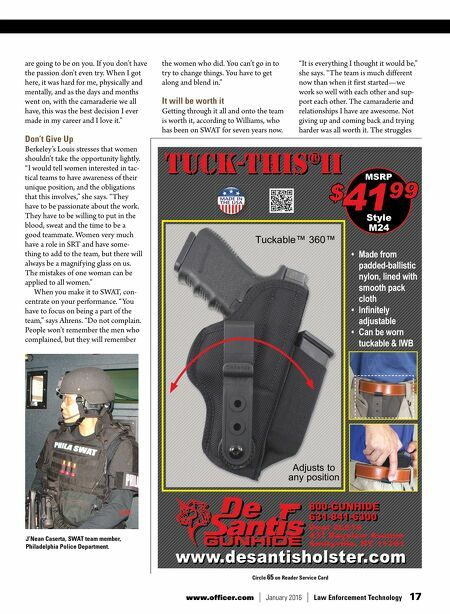 The struggles www.desantisholster.com www.desantisholster.com 800-GUNHIDE 631-841-6300 800-GUNHIDE 631-841-6300 Dept #LE16 431 Bayview Avenue Amityville, NY 11701 tuck-this ® ii tuck-this ® ii Tuckable™ 360™ Adjusts to any position • Made from padded-ballistic nylon, lined with smooth pack cloth • Infi nitely adjustable • Can be worn tuckable & IWB MSRP Style M24 41 99 $ Circle 65 on Reader Service Card J'Nean Caserta, SWAT team member, Philadelphia Police Department.